Summer is certainly coming to a close, and I’m rather surprised how quickly it seems to have crept up on me. Though we are still waiting for news on whether or not school will start on time this year, I am preparing as though the first day will come when and as it always does. That means it is time for me to start shifting gears and getting back into our school year routines. First thing I did was pull out my Home Keeping Checklist. I didn’t really use it this summer, mainly because it wasn’t working as well as I wanted it too. So, I spent a little time mulling over the problem and decided what I needed to do was make another printable to help it out. 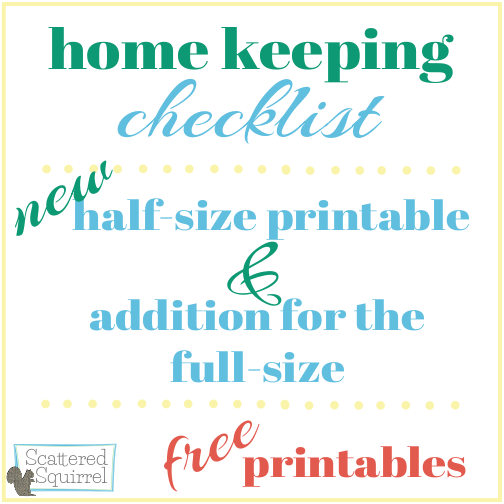 You remember, back in May I shared my new Home Keeping Checklist printable. 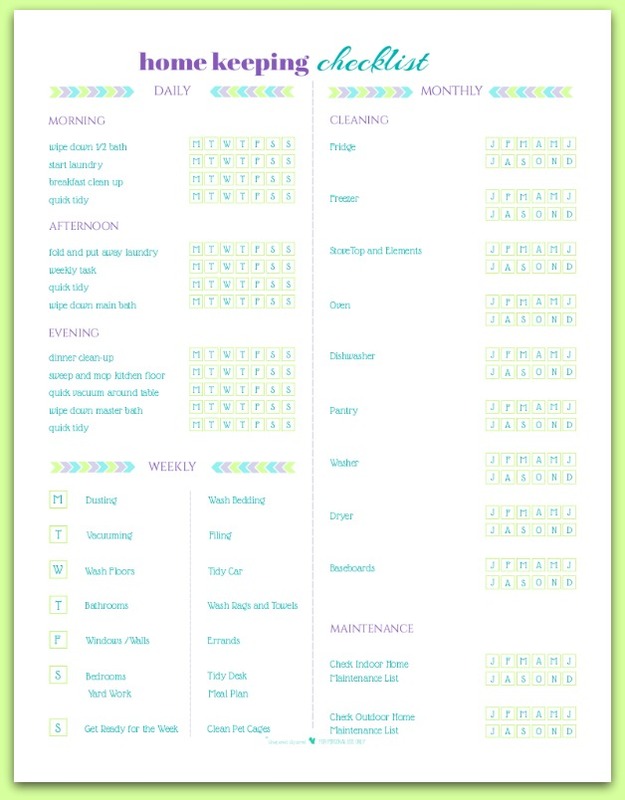 I designed it to be a tool I could use to help me stay on track when it came to keeping up with the housework. My plan was to tuck it into a page protector and use a wet erase marker to check things off. I figured it would be easy enough to erase the daily and weekly sections each week to reuse it. Well, it didn’t really work like I hoped it would. I know it would work well if it was printed on card-stock and laminated, but I don’t have a laminator (though I have it on my wish list) and I haven’t had a chance to take it in to an office supply store to have them do it. Since I really want to have it in my planner I needed to come up with a solution that would work. Then it hit me! 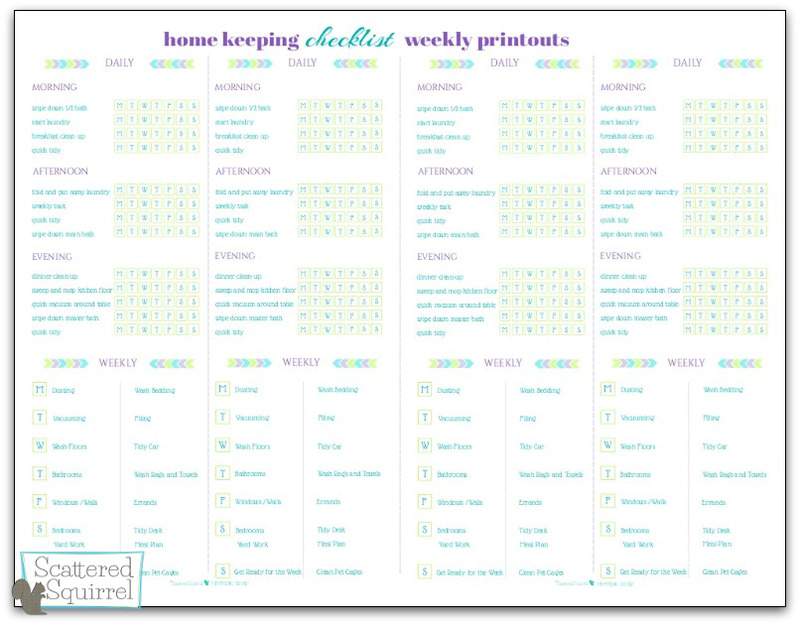 Why not make a separate printable, one with only the weekly checklist on it. Of course that is exactly what I did. Now I can print this one out double-sided, cut the page in half and hole punch them so they fit in my planner. I can simply add a new weekly printout half sheet each week, but my monthly items will always be there until the end of the year when I will need to print out a new one. I’m excited to give this one a try. I haven’t had a chance to yet, as I just finished putting the finishing touches on it this morning. And I didn’t forget about those of you who prefer to use half-size planners. 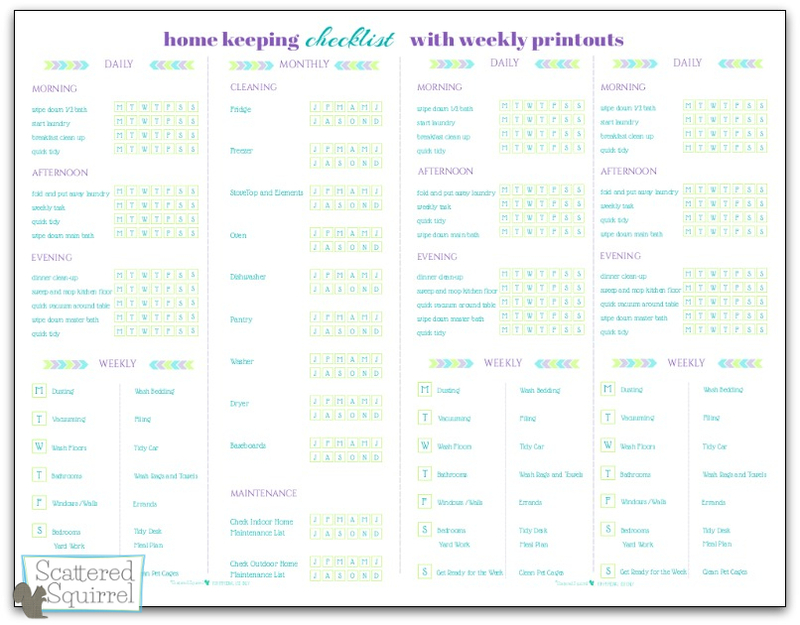 I’ve been meaning to make a half-size version of the home keeping checklist, and this was the perfect opportunity to do so. Just like the full-size version, one half is for daily and weekly tasks and the other half is for monthly cleaning and maintenance. The second ‘page’ is extra daily and weekly checklists so that if you’re like me you have extras. 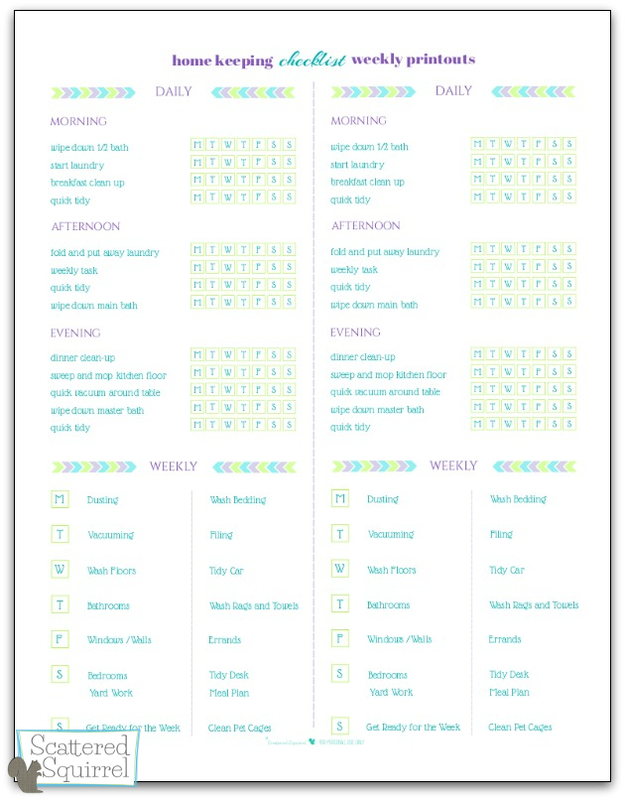 And because I learned from my first attempt I also made a second half-size printable that is just the daily and weekly checklist. There is four on a page, so if you have a whole month of checklists ready to do on one page! Nothing brightens my day more than whipping up a printable, especially when it’s a printable that will help make life a little easier. As I start getting back into my school year routines, having the home keeping side of things all ready thought out is going to be a huge help. I don’t have to think about it at all, just check my list each day and tick the items off as I do them. I think this is the closest I will ever get to having a self-cleaning house. And now, if you’ll please excuse me, I’m off to go get some printing done so I can start putting these to good use. Do your routines change when school starts? What tools do you use to help keep yourself on track? I really love your printables. I use them quite a lot in my Happy Planner. Thank you for sharing them & keep up the great work! Thank you so much Shilo. I’m happy to hear that you’re getting some use from the printables. Do you mind me asking, how do you use them in your happy planner?